In a piece that first appeared in Encore, evolution media group CEO Vanessa Stoykov reveals her media guilty pleasures. Who is the most powerful person in Australian media and why? Adrian Swift, director of development at the Nine network. Look at The Voice. It’s a very positive show. I like that. And I like what Adrian Swift does for celebrity. It was good to hear Joel Madden thank him at the Logies. Adrian Swift picks positive people for the judging roles on The Voice, but not necessarily the obvious people: Ricky Martin wasn’t the celebrity of the moment, but he is now. What one medium could you not live without? My smartphone is my connector to the world. It links me to my email and lets me know my kids are OK. And it’s my camera: I’m a reporter of life. My smartphone means I’m no longer that tragic person constantly looking for a computer to log on to, like I was on my honeymoon at Uluru. Your one guilty media pleasure? I have NW in my bathroom, but my 20-year guilty pleasure is The Bold and the Beautiful. I record every episode and watch them on weeknights while I’m working at home. Most of the characters have been there since the beginning and I’ve invested in them. I own a company and the show is based around a family company. It’s fantasy for me. I called this eight years ago: it’s online TV. It’s not there yet in Australia, but it will be. People will watch most of their content through their smartphones: I’m convinced of it. And I do see a future where corporations will have their own TV channels. If you weren’t doing this for a living what would you be doing? I like philosophy. It’s a useless skill, but I like it. I wouldn’t mind teaching it. It’s nice to think about things big picture. Don’t give up. Different people have said it and we recorded an interview once with Mark Bouris who said it very compellingly. It’s just so true. I don’t think you have to be the most talented or the smartest: just don’t give up. If you could poach any one person, who would it be? Oprah. I like that she makes people think about what makes them happy, which might not be the material things. She’s not perfect and she doesn’t pretend to be. She’d be a great mentor and a great board member. Would you recommend working in this industry to your kids? Yeah, I would. My kids were just about born in the office and my eldest son, who is nine, thinks he will be CEO of evolution media group. There’s a damn good chance he will be, but he’s got to get out in the real world first. What is your favourite Aussie ad? I like humour and things that are tongue in cheek. I like some of the beer ads. I thought the coffee people who got George Clooney were clever. People buy celebrity and celebrity endorsement makes good TV. Vanessa Stoykov is the CEO of evolution media group. Their series The Bottom Line, produced in conjunction with CPA Australia, screens on Nine from June 22. This story first appeared in the weekly edition of Encore available for iPad and Android tablets. 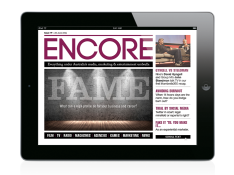 Visit encore.com.au for a preview of the app or click below to download.